Gold. It's getting harder and harder to find. The world's richest gold deposits are being depleted. New discoveries are rare – few and far between. Some industry analysts suspect we are getting close to "peak gold," which refers to the time when the world will hit its maximum rate of gold production and then start to move lower. Three years ago – in 2015 – a Goldman Sachs report warned that there are only two decades of "mineable" gold left. “The combination of very low concentrations of metals in the Earth’s crust, and very few high-quality deposits, means some things are truly scarce,” said Eugene King, a mining analyst at Goldman Sachs. In recent years, yearly gold production has averaged between 2700 and 3200 tonnes. 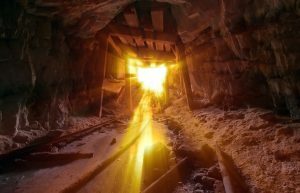 "The best estimates currently available suggest that around 187,200 tonnes of gold has been mined throughout history, of which around two-thirds has been mined since 1950," according to the World Gold Council. "And since gold is virtually indestructible, this means that almost all of this metal is still around in one form or another." If every single ounce of this gold were placed next to each other, the resulting cube of pure gold would only measure around 21 meters on each side. China was the biggest gold producer in 2016, mining about 14% of the total annual supply. Check out the The World Gold Council's handy interactive gold mining map to see how much different countries produce. There are lots of reasons to own gold. It's a safe-haven assets, a hard currency and a portfolio diversifier. Governments around the globe recognize the value in gold. The concept of "peak gold" only adds to the allure. One of the biggest detractors of paper or so-called "fiat" money is that governments can devalue it at any time by flipping on the printing presses. The United States and other advanced economies did exactly that in the years after the 2008 global financial crisis. They called it "quantitative easing," but that's just a fancy term for adding more dollars into circulation. That can't ever happen with gold. There is only so much gold that can ever be mined from the earth. Gold has been used as a measure of wealth for 4000 years, in part because of its rarity. If we do reach peak gold in the years ahead that would be broadly supportive to future price gains. Investing in physical gold is very easy, and any investor can do it and should do it. There are different weights of gold available, so investors can buy coins that are as little as 1/10 of an ounce up to the more standard one ounce coins, in addition to larger bars for investors making a more sizeable investment. Blanchard continues to lead the industry we helped launch in the 1970s. We develop innovative ways to help investors enhance and protect wealth through the strategic acquisition of tangible assets. Through our consultative approach to service, we aim to develop long term relationships that help investors achieve sustained financial success. A dedicated advisor is assigned to each client to advocate in his or her best interest. Call us today at 1-800-880-4653 to get acquainted.